This Saturday 29 March come down to Cotton Tree Park and celebrate Earth Hour 2014 in style. The Sunshine Coast Environment Council is organising a fully unpowered, unplugged, torch lit, acoustic music spectacular on the banks of the Maroochydore River. 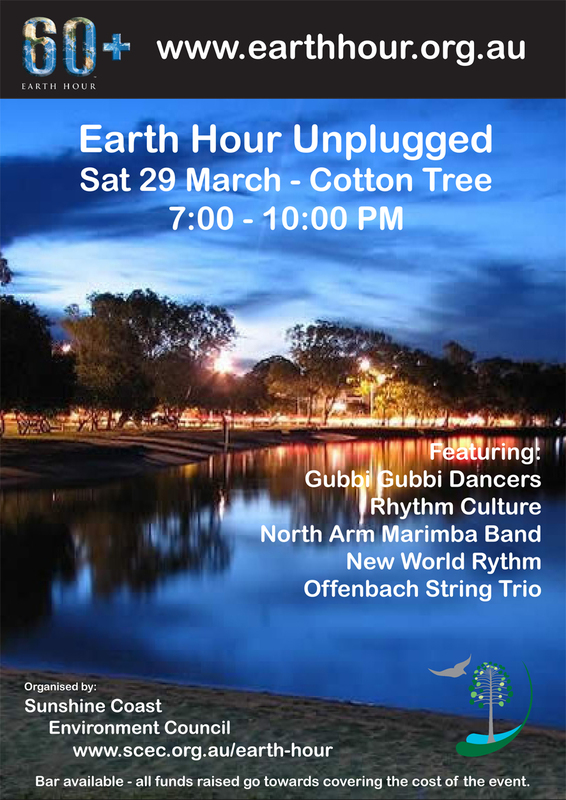 BYO chairs and rugs to this free community event and join in a celebration of music, the coast, the environment and everything Earth Hour has come to represent. Bar available (all proceeds will help cover the cost of the event). Established in Sydney in 2007, Earth Hour is a global celebration observed in over 152 countries and more than 7,000 cities. Calling on people to pause for a moment and reflect on the urgency of climate change Earth Hour is a symbolic event representing the actions we all can take and all need to take in order to avoid dangerous climate change.